One bedroom/ 1 bath newly constructed cottage/ above-garage apartment with open ocean views out to Mohegan and several small islands. Sit and enjoy sunsets, sunrises and star-gazing next to the crashing waves of the Atlantic Ocean. Relax on the screened porch to the sounds of waves, fog horn and buoy bells while reading a good book. Watch the sailboats and lobstermen pull up their traps, search for sea glass on the beach or tiny creatures in tide pools as you jump from rock to rock on our private shoreline. Hike south along the rugged coastline to Grimes Cove and gaze out to Ram Island Light house. Close enough to enjoy BoothBay Harbor restaurants and shops or galleries, walks around scenic Ocean Point, or the Coastal Maine Botanical Gardens, yet removed from the hustle and bustle of the tourists and crowds. Nature abounds in this wooded area of Ocean Point. We have spotted osprey, seals, whales, deer, foxes and wild turkeys. This 750 square foot 1BR/1Bath above-garage apartment has stairs that lead guests up to a screened porch which opens into a tastefully decorated kitchen w/ water view dining and living room. The kitchen is well-equipped with stainless side-by-side refrigerator w/ ice maker and water dispenser, gas 4-burner stove w/ removable griddle, as well as a microwave and coffee maker. Dishes and utensils are provided for enjoying home cooked meals. A gas grill is available to cook up a juicy steak or burger, or you can have an old-fashioned clambake/lobster on our private beach! The cottage/apartment is tastefully furnished with comfortable furniture for lounging while reading or watching cable TV. (wifi included) Most days and nights you can open the windows to the ocean breeze but for the warmer days, it is air conditioned and has ceiling fans in the LR and bedroom to assure a comfortable and restful stay. We look forward to welcoming you to enjoy our "Ocean Spray" escape! Enjoy summer’s clam bakes or fall’s colorful foliage! Come and explore all that mid-coast Maine has to offer! Beth and Dan came to Ocean Spray as renters and loved it so much we bought the home and property. We feel so blessed and want to provide the same beautiful cozy feel that the previous owners were known for. Tom and Sara are still nearby. We have always loved the rugged coast of Maine. We feel so blessed to be able to see God's beauty and majesty of Maine's rugged Atlantic coastline. Beth vacationed on the Maine coast as a child and loved jumping from rock to rock with her siblings at various light houses. As adults, we brought our kids to Maine and longed to come back again. What we loved about this property were the wide ocean views and private shoreline. We always dreamed of having our own clam bake on the coast. This property was everything we dreamed of! It has a gradually sloping green lawn that provides a safe and level area to sit or play in the grass, yet a rugged Maine shoreline with tide pools for exploring. We have seen whales and seals and osprey off our shore. This property is close to Boothbay Harbor's restaurants and shops and excitement, yet we can come back down our private gravel road within minutes to relax and gaze out to endless open ocean views, feel the spray of the surf and be lulled to sleep by the sound of the waves and buoy rocking. Close to BoothBay Harbors shops and great restaurants. Sloping lawn to play and relax on, yet rugged rocky shoreline to explore. Nature abounds; see osprey, wild turkeys, deer, foxes, chipmunks, birds and wooded areas right along the shoreline. We have even spotted a whale and seals frolicking off our shore. Pick wild raspberries, as you walk along one of Maine's most scenic roads, Ocean Point. The view looks different each day depending on the time of day, whether foggy or sunny. We never get bored or tired of this beautiful area on Ocean Point. Come see for yourself. Bright and airy bathroom with granite vanity counter top. Separate toilet area for added privacy and access to walk-in closet. Plenty of fresh towels. The above-garage apt/ cottage is on a 3.5 acre oceanfront estate. Atlantic Ocean and Mohegan Island views from the dining room table/ views of Ram Island light house from the LR windows. Direct Atlantic Ocean crashing waves yards from your doorstep. Heat assures comfort all the way thru October's cooler temps! Well insulated too! Dine as you look out over ocean views and feel ocean breezes. Feel free to bring your meal down to the adirondack chairs followed by s'mores by the fire pit on the lawn near the shore. Open lawn to play or relax overlooking the open ocean view, blueberry bushes, wild black raspberries to pick along the ocean's shore. rent kayaks in the harbor and paddle over to Burnt Island light or paddle on Linekin bay minutes away. Great couples escape on rustic coastal Maine. Relax, hike, cook together, or jump along the rugged shore and renew your "inner kid" as you explore the rocky tidal pools. Close enough to Booth Bay Harbor attractions yet secluded enough to get away from it all. Go back in time as you discover East BoothBay's general store, church and post office and Ocean Point's historic and famous scenic drive. Use our cottage as a starting point to explore all of coastal Maine from Portland to Bar Harbor's Acadia Nat'l Park. Kristi, so glad you had such a wonderful experience at our Ocean Spray cottage/apartment for two! We love all that this area has to offer and are so glad you did too! Come again! Everything was clean and the location was quiet and peaceful. I would stay here again if I was vacationing in this area again. We are so glad you enjoyed the area and its beauty! We look forward to seeing you again! Quaint cozy cottage at the waters edge! We have been staying at Ocean Spray for the last 4 years. It is our northern paradise! It is remote enough to be quiet and relaxing (hearing the ocean waves, listening to the buoy bell ring as the waves rock it to hearing the lobster boats as they check their traps) but close enough to activities and wonderful food. We have hiked trails, antique shopped, ate our way through mid Maine and enjoyed some water activities. Ocean Spray is the prefect place to relax and read a book beside the ocean, enjoy an evening bon fire and just recharge your batteries. The cottage was clean and well maintained. We encourage all couples to try this place, just not on the week we want! LOL. What a blessing having you stay at our vacation cottage again! So happy you will be back again to relax and renew to the sounds of the waves! A beautiful house in an ideal location! This place was absolutely beautiful. Everything is wonderfully maintained and I would definitely recommend staying here if you want ocean views and a relaxed atmosphere. So glad you enjoyed our vacation cottage and views! We hope you will come back again to relax and restore! This property has the most spectacular view of the Maine Coast while still close enough to the action of downtown Boothbay. The home inside is beautiful and comfy with all the amenities you would find in a 5 star hotel. Pick wild blackberries or raspberries while watching the lobster boats pull their traps. Have fun climbing the rocks searching for sea glass and then return to count your treasure. So relaxing. Then head into town for shopping and waterfront dining. People are friendly and give great service. A shout out goes to Dr. Nadeau, the optometrist, who removed the broken contact from my daughter's eye. Our only payment to him was to eat a lobster in town. Loved the breeze and waking up to spectacular views with the sound of the channel marker's chimes. A dream vacation come true. You can't go wrong renting here for your next vacation, the owners are great people as well. Accommodating and friendly. We were looking forward to some rest and relaxation, but were blown away by just how rejuvenating our time here was. The incredible view of the rugged rocks and waves and serene water in the background with sounds of waves crashing was the perfect way to wake up each morning. We enjoyed time exploring the quaint town of Boothbay Harbor and neighboring towns, eating lots of fresh lobster, hiking around some of the trails, and walking around Ocean Point to get some exercise, pick wild raspberries, and enjoy the views. We spent our nights trying different local restaurants nearby and sitting by the fire as we sipped on wine and watched the sunset turn into a blanket of stars in the sky. 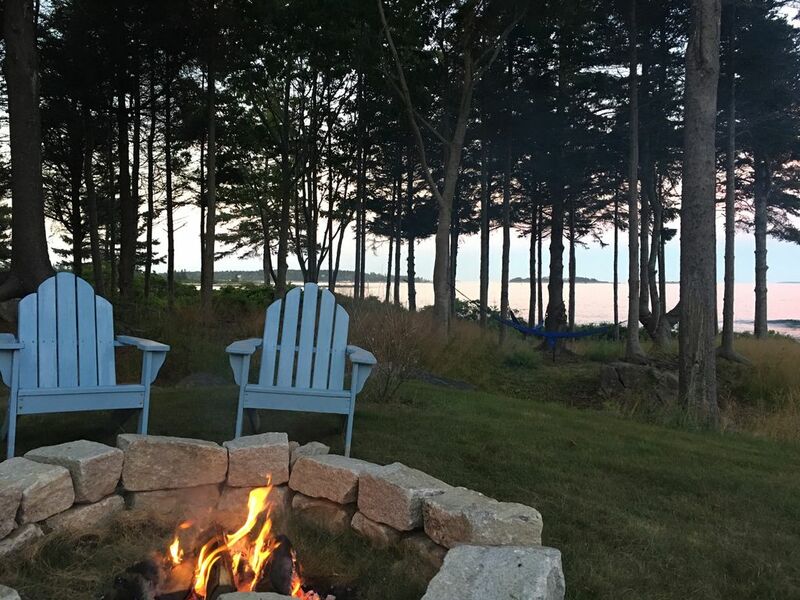 If you're looking for a relaxing and romantic getaway with the full Maine experience, this is the perfect spot. We will definitely come back! Ocean Point is a scenic area at the tip of East Booth Bay, 10 minutes from Booth Bay Harbor Marine Aquarium and Coastal Botanical Gardens and Whale watching and LightHouse tours.